EDMONTON, March 26, 2018 /CNW/ - Altiplano Minerals Ltd. (TSX-V:APN) (OTCQB:ALTPF) (FWB:9AJ1) ("APN" or the "Company") is pleased to report results of the 395M Level underground sampling obtained between January and March at the historic Farellon Copper-Gold Mine, La Serena Chile. During late January to early March, a total of 77 samples in 22 sampling lines distributed every ~3m along 97 m of horizontal drift vein development have been analyzed. Each line represents a sampling channel (~5cm wide and ~2cm depth) across the vein and includes typically three continuous samples separating magnetite- and chalcopyrite-rich bands. Figure 1 and Table 1 show the channel sampling line locations and results of selected interval composites obtained during this period. Selected but continuous intervals from this recent sampling with an average width of 1.73 m contain grade averages of 4.03% Cu, 39.94% Fe, and 0.16 ppm Au including high-grade intervals of up to 11.33% Cu, 28.89% Fe and 0.29 ppm Au over 2.55 m. The average width of selected intervals from a total of 117 samples collected along the 137 m of exposed vein in the 395M level is 1.70 m with grades of 3.60% Cu, 41.87% Fe, and 0.16 ppm Au (see website for full results). The Company will continue developing, mapping, and sampling the 395M Level along the entire Farellon property (Figure 1 inset), as well as the recently opened 401 and 414M Levels to continue exploring the vein and estimate reserves. To date, the Company has removed 3,680 tonnes of Cu-Fe-Au vein material from the 395M level covering a horizontal distance of 137m. The Company has shipped 2,320 tonnes for processing and an additional 1,360 tonnes stockpiled for shipment shortly. During late March, the Company has opened the 414.5M level above the 395M level for extraction of Cu-Fe-Au vein material. 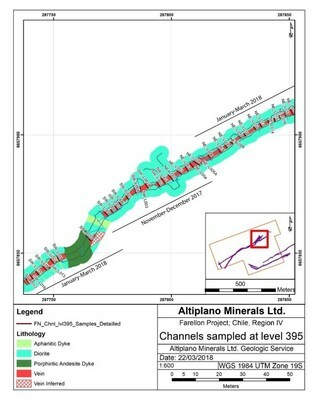 CEO John Williamson stated, "We are pleased with the recent results showing high-grade Copper intervals and are excited to continue exploring the Farellon Project within the newly opened levels." As part of its ongoing program, Altiplano is carrying out the recommendations contained in the APEX Report of February 10, 2017 filed on SEDAR for the exploration development of the Farellon project and is also relying upon past production records, underground sampling and related activities and current diamond drilling to estimate grade and widths of the mineralization. There are no mineral resources or reserves on the property and the current mineral exploration activities are intended to be part of a program to determine if mineral resources can be identified. No production decision has been made at this time. Should a production decision be made without completing a feasibility study demonstrating economic and technical viability, there would be increased uncertainty as well as economic and technical risks of failure associated with such a production decision. Osbaldo Zamora Vega, PhD, P.Geol., Vice President of Exploration for Altiplano, is the Qualified Person as defined in National Instrument 43-101 who has reviewed and approved the technical contents of this press release.